This butterfly technique article explains how to execute the arm stroke movements properly. Those movements are somewhat similar to the ones used in front crawl. The main difference, however, is that both arms move synchronously. 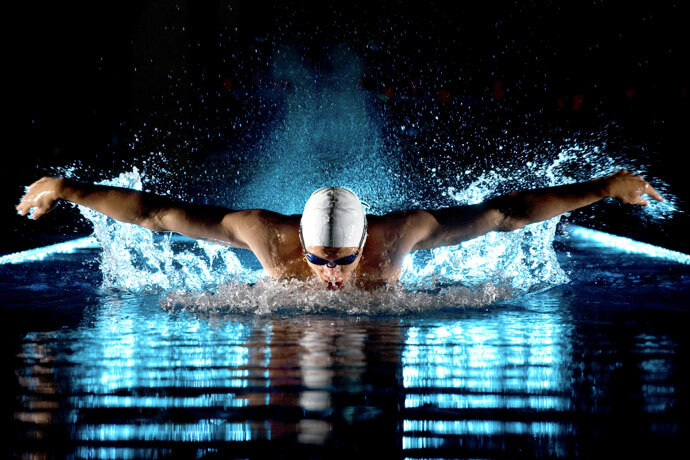 We can see the butterfly arm stroke movements in the following video, starring Michael Phelps. As you can see above, both arms move synchronously. Underwater, the hands move from an overhead position towards the hips. The hands leave the water once they are close to the hips. The arms then recover forward above water back to their initial position. We will now analyze the different phases of this butterfly technique in more detail. Your arms enter the water at the end of the recovery in front of your head. Your arms are either completely straight or slightly flexed at the elbows. During the entry, your arms should be about shoulder width apart or slightly less. Your palms are facing downwards and maybe also a little bit outwards. After the entry in the water, your arms will extend and stretch forward for a short amount of time because your chest is driven downwards and forward by the body undulation. During the outsweep, your arms transition from the extended forward position into a position where your palms and the bottom of your forearms are facing backward. To do so, after extending your arms forward, your hands move outwards, downwards and backward, with your palms successively facing those directions. The catch occurs when your palms and forearms are in line and facing backward and a little bit downwards. This is the beginning of the propulsive phase of the arm stroke. Your hands should be about shoulder width apart, and your elbows bent. During the insweep, your hands move inwards, backward and upwards, from outside the shoulders to below your chest. This is the first propulsive phase of the arm stroke. The palms are successively facing backward, inwards and then upwards. The elbows, still being bent, are being brought against the rib cage. During the upsweep your hands move from below your chest towards your hips. To do so, your palms rotate from facing backward, inwards and upwards to facing backward, outwards and upwards. Your elbows are still bent and move a little bit away from the rib cage. This is the second propulsive phase of the arm stroke and it stops before your arms are completely extended. Otherwise, with extended arms, you will be pushing water upwards instead of backward. The release occurs at the highest point of the body undulation when the shoulders clear the water. Your arms should leave the water before they are completely extended and before your hands reach the hips. Your arms leave the water in this order: shoulders, elbows, forearms, and hands with the pinkie first, palms facing inwards. This ensures that you create the least amount of drag while moving your arms out of the water. You should use the momentum of the release to begin the recovery of your arms. Your arms recover forward in a half-circular fashion and hover above the water surface. The palms are first facing upwards and then progressively rotate until they are facing downwards at the end of the recovery. At the beginning of the recovery the elbows are always bent. At the end of the recovery your elbows can either be straight or slightly bent. The cycle can then start again. The shape drawn by your hands in the water looks like a keyhole pattern: first, your hands separate during the outsweep, then they converge while moving below your chest, then they separate again and move towards the hips. The arm speed underwater builds up after the catch and is the highest during the upsweep. Use this momentum to throw the arms out of the water and start the recovery. As explained above, during the outsweep, do not move your hands all the way up to your hips. Exit the water a little bit earlier while your arms are still slightly bent.